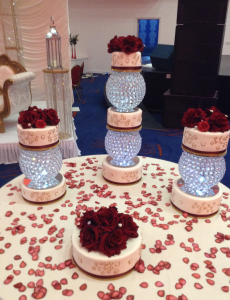 Our new Crystal Globe Wedding Cake was a massive talking point for the wedding guests at the stunning CSN conference centre, Birmingham on Saturday. The crystal globes are individually lit by a set of led lights and each of the 8 wedding cakes were differently flavoured to delight the guests. One of our other stunning and eye catching eggless wedding cakes delivered to the Norfolk Hotel Birmingham, was inspired by our Rose Signature Wedding Cake. 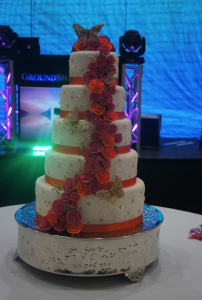 The wedding cake had cascading orange and hot pink rose flowers adorned with gold butterflies and and held centre stage at this 800 guest wedding reception. We have some fantastic newly arrived products in our Cake Decorating Shop, Knowle, Solihull, West Midlands. The new cupcake and butterfly candles have been very popular and the new dinosaur and fairy sugar piping cake decorations are ideal for simply decorating cupcakes and celebration cakes. We have a great selection of Easter cake and cupcake decorations for you to create your very Easter treats in our Sugarbliss Cake Decorating Shop, Knowle , Solihull. Our selection of cookie cutters are perfect to create cookies for all occasions. 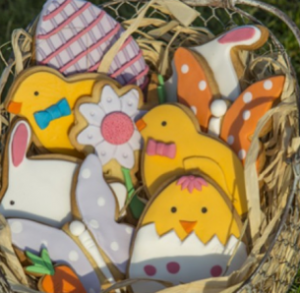 Why not try out our Easter Cookie recipe to create 12 delicious Easter Cookies. Loving Everthing To Do With Cookies! We have lots of wonderful Easter cake decorations at our cake decorating shop for you to create your very own special Easter treats. From Easter cupcake cases, Easter chicks and ribbon to Easter egg and carrot edible sugar piping, which look great on any cake or cupcake. 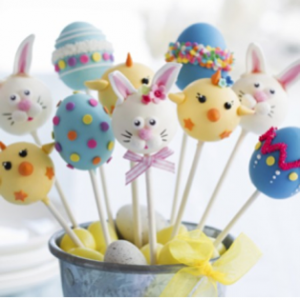 Ever thought of making your own Easter cake pops follow our simple instructions to create your Easter cake pop treats. Mix ingredients and fill the bottom of the cake pop mould ¾ of the way up and place the other mould on top. Place in a heated oven at 180°C/ 356°F for 20 minutes. Using oven gloves take the mould out of the oven, and allow the cake balls to completely cool, gently remove the top mould releasing the cake balls. Then use cake pop sticks and dip each stick into desired topping and place about 15mm into a cake ball and then place in the fridge for about 2 hours to set. Once dry, be creative with icing and create your own Easter bunnies, eggs and chick. Loving Everything To Do With Cake Pops!